Aligarh: Former Indian President, Shri Pranab Mukherjee today delivered the commemoration address as the chief guest on the bicentennial birth celebrations of Aligarh Muslim University (AMU) founder, Sir Syed Ahmad Khan at the university’s Athletics Ground. 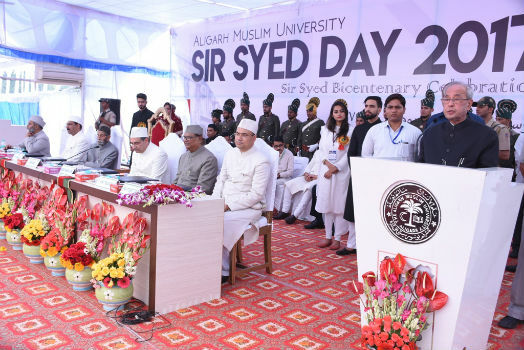 “It is a privilege to be in AMU on the occasion of 200th birth anniversary of Sir Syed Ahmad Khan, the visionary leader of India,” said Shri Mukherjee adding that Sir Syed was far ahead of his time as he thought of empowering common people with modern scientific education at a time when India was a newly colonised society and ignorance was prevailing. Shri Mukherjee said that Sir Syed began his mission by promoting western–style scientific education by founding modern schools and journals. 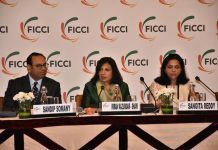 “Sir Syed established a school at Muradabad, the Victoria School at Ghazipur in 1863, and a scientific society for Muslims in 1864,” added Shri Mukherjee. He further said that Sir Syed’s journey to accomplish his mission took him to founding the Mohammadan Anglo-Oriental College in 1875, which eventually became the Aligarh Muslim University. 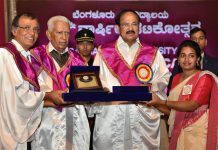 Shri Mukherjee pointed out that in today’s world, we need to take Sir Syed’s mission forward by concentrating on innovation, research, building a knowledge based society and taking the reputation of the country to new heights. He also pointed out that AMU is a perfect example of Indian nationalism and ethos, where students from different religions, ethnicity, linguistic backgrounds and culture integrate and work together in productive ways. In the welcome address, AMU Vice Chancellor, Professor Tariq Mansoor said that Sir Syed changed the destiny of the nation by devoting his entire life for education. Prof Mansoor added that the supreme interest of Sir Syed’s life was education in its widest sense as he wanted to create a scientific temperament among the common Indians. “Sir Syed was a Messiah, who worked for education and secularism through his versatile writing and farsightedness,” said Prof Mansoor adding that Sir Syed wanted to make modern knowledge of science available to common people. Prof Mansoor said that Sir Syed was committed to the idea of pluralism and modernity to resist the forces of sectarianism and divisions. “Sir Syed believed that knowledge and education will broaden horizons to counter hatred, bigotry and narrow perspectives,” further pointed out the Vice Chancellor. He also said that it is a matter of great satisfaction that the University Grants Commission, Ministry of Human Resource and Development has approved an allocation of nearly Rs 90 crores to AMU for the next three years, which will greatly support the ongoing projects and will help enhance various kinds of facilities in the university. While concluding his address, Prof Mansoor said that as AMU celebrates Sir Syed’s bicentenary celebrations till October 2018; let us (AMU community) work with dedication to achieve the goal of quality education. 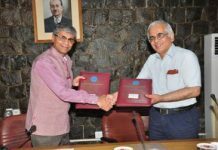 Shri Muhkerjee and the Vice Chancellor honoured Prof David Lelyveld and Justice MSA Siddqui with the international and national ‘Sir Syed Excellence Awards’ on the occasion. Prof Javaid Akhter (AMU Registrar) read the citations for the awardees. Justice MSA Siddqui during his acceptance speech said that AMU has always been close to his heart and he is proud to receive this award in Sir Syed’s ocean of knowledge and education. Prof Mohammad Muneer Khan from the Department of Chemistry, AMU was conferred with the Sir Syed Innovation Award – 2017 (Outstanding Researcher of the year, Science Stream). The winners of the ‘All India Essay Writing Competition’ on the topic of “Relevance of Sir Syed in the New Millennium” also received their prizes from the chief guest and the Vice Chancellor. With a cash prize of Rs 25,000, Rajvardhan Tiwari, a BALLB student at the Chanakya National Law University, Patna bagged the first prize while Kaif Siddiqui, a BA LLB (IIIrd semester student) at Aligarh Muslim University won the second place with a cash prize of Rs 15,000. Anusha Pillay, National Institute of Technology, Raipur, has emerged third with a prize of Rs 10,000. Meanwhile, Abdul Sabur Kidwai of AMU won a cash prize of Rs 5, 000 as a state topper from Uttar Pradesh. Prof Syeda Nuzhat Zeba (Department of English), Dr Mohibul Haque (Associate Prof, Department of Political Science), Mr M M Ashraf and Ms Yusra Khan delivered special speeches on teachings, philosophy, works and mission of Sir Syed Ahmad Khan. Professor Jamshed Siddiqui (Dean Students Welfare) proposed the vote of thanks, while Dr Faiza Abbasi and Dr Shariq Aqeel conducted the programme. Nawab Ibne Said Khan of Chattari (Pro Chancellor), Prof Habib ur Rehman (Treasurer), Prof Y U Khan (Controller), Prof S M Jawaid Akhtar (Finance Officer) and other dignitaries were also present. The proceedings of the day began with a Quran Khwani (Quranic Recitation) at the university Mosque. Prof Mansoor with senior professors and officers of the university paid floral tributes at the Mazaar (grave) of Sir Syed after the traditional ritual of ‘Chadar Poshi’. Later, the Vice Chancellor with Mr J S Deshwal (Senior Superintendent, Aligarh, Department of Post, Government of India) released an album with a special cover on Sir Syed, My Ticket, brochure and a stamp with AMU logo to mark Sir Syed’s Bicentenary celebrations. The Vice Chancellor also inaugurated an ‘Exhibition of Books and Photographs pertaining to Sir Syed Ahmad Khan’ at the Sir Syed House. The exhibition was jointly organised by Maulana Azad Library and Sir Syed Academy. On the occasion, the Vice Chancellor released 11 books by Prof Mohammad Saud Alam Qasmi, Dr Razia Hamid, Prof Asghar Abbas, Prof S M Azizuddin Husain, Mr Obaidur Rahman Siddiqui, Dr Rahat Abrar, Dr Mohammad Mukhtar Alam, Dr Mohammad Zafar Minhaj and Dr Jasim Mohammad.